This rough guide to India review is not entirely made up of my experience with the book as I must admit that when I was in India I actually used the lonely planet guide book rather than this one but that does not mean to say that I have used the 'Rough guide' brand before but in other countries. I have the book here in front of me and the weight is something to be concerned about. Of course India is a big country and needs a big book but this is quite something weighing in at around 1.1kg. Other than this, the book is an excellent and far more interesting version to the acclaimed lonely planet so simply because of this I think that it is a better purchase. The reviews are in-depth and so I have heard - brutally honest whereas the lonely planet I employed 'far more nice people' lol. The Rough guide to India or Lonely planet? The lonely planet guide book is probably the most up to date with the last copy coming out in September 09 and this one coming out over a year earlier. On the plus side it is quite a lot cheaper. I have heard that the maps are somewhat inaccurate whereas the lonely planet ones are flawless. Compare the features before you make your decision. Personally, I think the similarities between the books are fairly large so any time spent deliberating between the two is pretty pointless - in other words just flip heads or tails. The problem with this question is not whether you should buy the book but more is it the 'right one' for you. However a trip to India without a book such as this is, in my opinion, a bad idea. And as I always say when writing these book reviews, is that it really doesn't matter a great deal anyway because you will have countless opportunities to swap, exchange and sell books everywhere. Expert background information on everything from temple architecture to Indian classical music. Without a doubt the best place to buy this book is amazon.com who have a great selection of new and used books on offer for a surprisingly large array of prices. 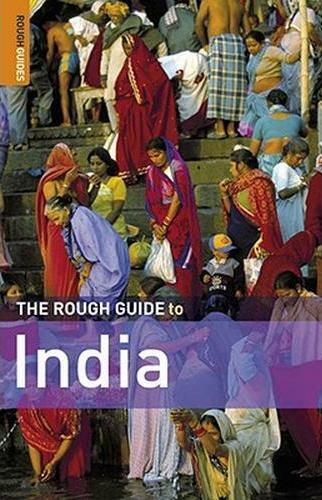 Discover a land of exotic beauty and inspiring culture with The Rough Guide to India, the most comprehensive guide to India on the market. The 36 page full-colour introduction with stunning photography will whet your appetite for the country’s many highlights, from fast-paced Delhi and the sacred sites of the Ganges plain to the Moghul splendour of Agra and the shell-sand beaches of the south. The guide features three new colour sections on Sacred India, Handicrafts and Bollywood, as well as expert background information on everything from temple architecture to Indian classical music. Easy-to-use maps and extensive accommodation and restaurant listings, plus all the practical grittiness you’d expect from a Rough Guide make this your must-have item for the trip of a lifetime. I think that in this case yes you probably do and given it's reasonably cheap price on you would be a bit of a cheapskate not too! I hope this rough guide to India review was useful you but if however you still not quite sure if this is what you are looking for the n just take a look at some of these other reviews.